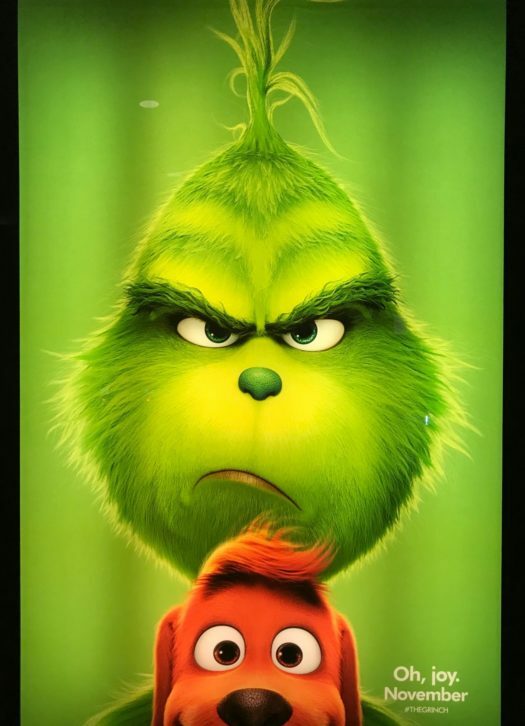 One of the movie poster showing off the Grinch adorableness in the new movie "The Grinch"
Yet another version of Dr.Seuss’ “ How The Grinch Stole Christmas” has come to the big screen with a new name, a new look, and less disturbing for the young ones. Now called “The Grinch”, such an original name, instead of following its other predecessors. This new movie differs in more ways than one. Upon seeing the first released trailer of the newest version of the holiday classic, many people thought that the Grinch had a more adorable look to it, whereas the Jim Carrey version or the drawings in Dr. Seuss had a more frightening image that scared little kids away, maybe even adults. “This Grinch does not look at all grumpy,” said Bladensburg High School junior, Iris Perez. “It just looks like he needs to sleep because he looks adorable.”. Not surprising since the 2018 Grinch looks like a little squeezy ball of green cuteness, the people in Whoville actually wanted to talk to him and invited him to participate in the holiday activities due to him looking like a ball of fluffy cuteness, a much different chain of events than the original Grinch who doesn’t really go out of it cave to talk to the people and Jim Carrey’s Grinch that definitely can give you some nightmares so it makes it more understandable why he was shunned by the people of Whoville. The newer version of “The Grinch” has a better quality to it, you can see all the details that the makers of this movie really put in this movie. Without trying to spoil anything from the movie, (even though you guys already know the main parts of this movie) the makers introduced new characters that didn’t participate in the other versions of the Grinch storyline. These new characters helped the Grinch’s heart grew three times the size. The modern movie also sheds more light on the reason why the Grinch is the person who hates the holidays. This scene might actually make you shed a tear. The message “The Grinch” was trying to portray is actually the same message all Christmas movie portrays as well; that Christmas is more about giving than receiving. “The biggest message is try to share rather than to receive without expecting anything in return and you should also be caring because that’s what Christmas is about.” said Perez. Overall, the new Grinch movie is pretty good, the narration is pretty good, it’s details are pretty good as well, and if you like the classics that you should totally go see this movie it’s a fun throwback movie. “I would say if you’re looking for something cute that will trigger your emotions a little bit, you should watch it. It was a cute movie with a valuable lesson.” said Jenifer Flores-Colato.” The Grinch” is a classic holiday movie you can’t call yourself a Christmas lover if you don’t watch “The Grinch”.